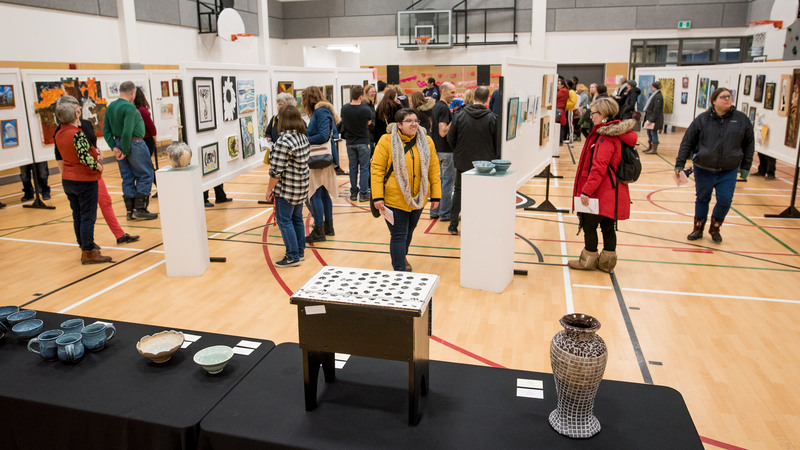 The 18th annual Art from the Heart show and sale is a two-day exhibition featuring works by Winnipeg’s inner-city and lower-income artists. All proceeds from the show go directly to the artists. Andrea Roberts is this year’s exhibition co-ordinator. She is responsible for co-ordinating the art and artists along with a crew of 30 volunteers. “I think that it’s a really unique event in Winnipeg,” Roberts said. “It is a community event that brings people from all over Winnipeg, but it’s really focused on supporting inner-city and low-income artists. It has a great, really open and fun feel to it — people can come and bring their kids and there is always music, and there’s really, really affordable art, too. Winnipeg garage-pop trio Mulligrub will be performing on opening night, and guest DJs from Nostalgia Radio CJNU 93.7 PM will spin on the second night. The sale provides an opportunity for Winnipeggers to support their artistic community without a hefty price tag. Without a high cost barrier, the sale boasts a large turnout. “We get hundreds of people every night — five to six hundred people over the weekend,” said Roberts. Art from the Heart began as a grassroots organization in 1999 at the Magnus Eliason Recreation Centre in downtown Winnipeg. They have since expanded to include over 200 artists who participate during their various events and workshops throughout the year, most notably the Art from the Heart show. Partnerships with different Winnipeg non-profits and arts organizations such as Art City, Studio Central, the Daniel McIntyre/St. Matthews Community Association, the West Broadway Community Organization and many others have allowed the event to grow. Art from the Heart recently began working with Stony Mountain Institution, a prison located approximately 24 km north of Winnipeg. Last year, one artist from Stony Mountain was featured. This year, there will be works from five inmates. Organizers hope this will bridge a gap between inmates and the downtown Winnipeg community. “Every year we work on trying to bring in more artists that maybe wouldn’t have heard about Art from the Heart,” said Roberts. The continued support of this community of artists has helped keep the event going. The Art from the Heart show and sale will run Feb. 8-9 at the University of Winnipeg’s Axworthy Health and RecPlex, 350 Spence Street.